After 8 years of implementing the Law on Militia and Self-Defence Forces (hereafter the Law), the 3rd Military Region has obtained positive results, greatly contributing to making local armed forces, all-people national defence, all-people national defence posture, people’s security posture and defensive zone in its area strong. To effectively execute the Law in a uniform, synchronous manner, the Military Region has accelerated the work of introducing, propagating and disseminating the Law. It has proactively developed plans and directed military offices at all levels to counsel local party executive committees and governments to build up plans on introducing, studying and implementing the Law and guiding documents to cadres at all levels. At the same time, it has directed the 3rd Military Region Newspaper and worked with provinces and cities to promote information and dissemination of the Law to the people from all walks of life. The Military Region and localities held 192 courses to introduce the Law to 46,426 cadres from sectors, offices and units in its area. Localities proactively compiled and issued documents on the Law; employed various forms and methods of propagation, particularly via mass media; combined propagation of the Law with that of the Military Service Law and local defence work. Moreover, the Military Region organized the “Contest about militia and self-defence forces law and militia and self-defence work” at all levels and took part in the Ministry-level Contest, thereby making a profound transformation in awareness and responsibility of cadres, party members, people and the Military Region’s armed forces towards the implementation of the Law. Besides introducing, propagating and translating the Law into reality, the Military Region’s Party Executive Committee and High Command as well as local party executive committees and governments opportunely issued documents to lead, direct and guide the implementation. 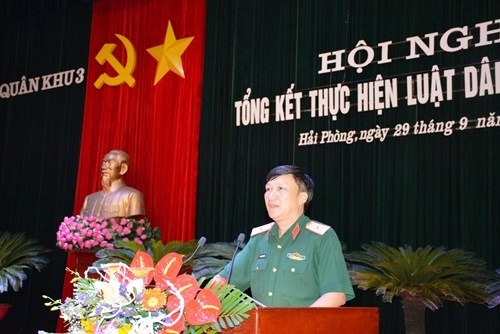 The Military Region’s Party Executive Committee released the Resolution 189-NQ/ĐU, dated July 2nd 2012, on strengthening leadership and direction over the improved quality of building and training the militia and self-defence forces, meeting the mission requirements in the new period. Provinces and cities issued resolutions, decisions, projects and plans for building and training the militia and self-defence forces as well as ensuring entitlements and policy for them to realize content of the Law, the Government’s resolutions and decisions, higher echelons’ directives in line with localities’ particularities. The Military Region has directed localities to attach the implementation of the Law to that of local military and defence tasks and the building of defensive area; to promote the synergy of the whole political system and the entire people, particularly the advisory, guiding, inspecting role of all-level military agencies. Adhering to regulations of the Law and guiding documents, the Military Region and localities have paid due regard to the work of building the militia and self-defence forces and taken synchronous measures. Steps in the process of organizing the militia and self-defence forces, ranging from registration, management of citizens at the age of militia and self-defence service to selection and acceptance, have taken seriously, publicly, democratically. Under the Military Region’s direction, localities have built the “diffuse” militia and self-defence forces with proper scale, structure and number and increasing quality in accordance with each area, focusing on the areas of central importance to defence and security, border areas, seas and islands. Significance has been attached to building core militia and self-defence forces, particularly mobile, active, arm militia forces, self-defence forces in offices, organization and enterprises as well as coastal militia and self-defence forces. It is noted that the Military Region directed Quang Ninh province to successfully build 4 exemplars in terms of organization, training, operation and management of the militia and self-defence forces according to the Prime Minister’s Decision 1902/QĐ-TTg, dated October 15th 2010, and the National Defence Ministry’s direction. To date, the Military Region’s militia and self-defence forces have been organized in 100% of grass-roots level administrative units and accounted for 1.55% of the population. The quality of the militia and self-defence forces, particularly the political quality, has improved. Localities have developed and effectively maintained the operations of 428 military party cells and mobile militia party cells. Training and cultivating commune-level military command cadres represent a highlight of the implementation of the Law by localities in the Military Region. In this regard, the Military Region directed and worked with cities and provinces to design projects and plans for planning and training commune-level military command cadres so that they would have a bachelor’s degree in local military major according to the Prime Minister’s Decision 799/QĐ-TTg, dated May 25th 2011. Since 2009, localities have dispatched 3,893 commune-level military command cadres for further training, while designating all positions in the military command of offices, organizations and militia and self-defence units, thereby making an important transformation in the quality of the militia and self-defence forces. Besides, due attention has been paid to training task and political, legal education regarding the militia and self-defence forces. Following the motto “basics, practicality, quality”, local military agencies have actively renovated content, forms and methods of training, meeting the requirements of building the all-people national defence posture and protecting the Homeland in the new situation. Over the past years, the Military Region and localities have held 1,025 training courses for 135,576 commune and hamlet level military cadres and trained 100% of militia and self-defence units. It should be noted that localities have directed communes, wards, towns and self-defence units to conduct defensive combat drills and mobilized hundreds of thousands of militia and self-defence members in defensive zone exercises, flood and storm prevention and combat, search and rescue at all levels, greatly contributing to completing mechanism and regulations on organization and operations of defensive zones. The Military Region and localities have closely led, directed and managed the militia and self-defence forces’ operations in conformity with law. The militia and self-defence forces in localities have regularly maintained the order and regulations on combat readiness, formulated and implemented plans for operations and regulations on coordination with other forces according to the Government’s Decrees 77/2010/NĐ-CP and 133/2015/NĐ-CP. Notably, they took part in patrol and control to maintain security and fight against violations of border, sea, island sovereignty as well as in natural disaster prevention and mitigation, hunger alleviation, poverty reduction, new-type rural area building, and implementation of the movements. Those operations have proved that they serve as the vanguard in performing military and defence tasks, mass mobilization, and protecting political security and social order at grass-roots level. Due regard has been paid to the work of ensuring entitlements and policies for the militia and self-defence forces in accordance with the Law and localities’ particularities. Provinces and cities promulgated resolutions stipulating the working-day allowance for militia and self-defence members’ training and operations as well as the responsibility allowance for cadres of communes, offices, and organizations’ military command. Moreover, significance has been attached to planning and building training grounds, purchasing training aids, and providing private work accommodation for all communes, offices and organizations’ military commands, greatly contributing to the improved efficiency of the militia and self-defence forces. Following the Prime Minister’s Directive 09/CT-TTg, dated March 24th 2017 and the guidance by the National Defence Ministry, the Military Region’s High Command carried out a comprehensive review of the implementation of the Law (promulgated in 2009). Accordingly, it seriously indicated strong and weak points, and set out the guidelines and tasks for the militia and self-defence forces in the coming time, while recommending matters for adjustment, supplementation and amendment to the Law in line with realities to higher authorities. Besides stepping up legal propagation and dissemination related to the militia and self-defence forces, particularly in remote, isolated areas, border areas, seas and islands, the Military Region has directed localities and units to successfully implement projects and plans on building, training and managing the militia and self-defence forces, with a focus on overcoming difficulties in building the forces in state-owned and foreign-invested enterprises. It has directed the building of mobile, active, coastal militia and self-defence forces in the areas of central importance to defence and security, taken measures to improve the overall quality of the militia and self-defence forces, first and foremost the political quality, while counselling localities to multiply the model of commune-level military party cell, particularly in border, coastal, island communes, and successfully performing the work of planning, training, disposing and using commune-level military command cadres. Moreover, localities have strengthened state management of the militia and self-defence-related work; ensured that the militia and self-defence forces rightfully perform their functions and tasks; actively mobilized resources for logistics work. As a result, the Law has been brought to social life in order to build the Military Region’s “strong, diffuse” militia and self-defence forces as the basis for making the all-people national defence, the all-people national defence posture, the people’s security posture and the defensive zone strong, meeting the requirements of national construction and protection in the new situation.